Okay gals (and guys? ), this is my first official tutorial. Step-by-step and everything. Hope you're ready. First I started with 20-gauge wire from a spool. Make sure to get the kind on a spool so that you don't have to worry about forming the wire into circles. I cut it at the 2-circle mark but you could do this as long as you like. Memory wire is also a great choice for this project as it will keep it's shape. Thread a crimping bead somewhere close to the middle and crimp it (squish it) with flat-nosed pliers. Does everyone know what a crimping bead is? It's just a hollow metal tube that you are able to crush so that it stays put. This is helpful to keep separate beads from sliding all over the place and awesome for attaching findings to the end of a piece. So, thread the crimping bead and crimp it. 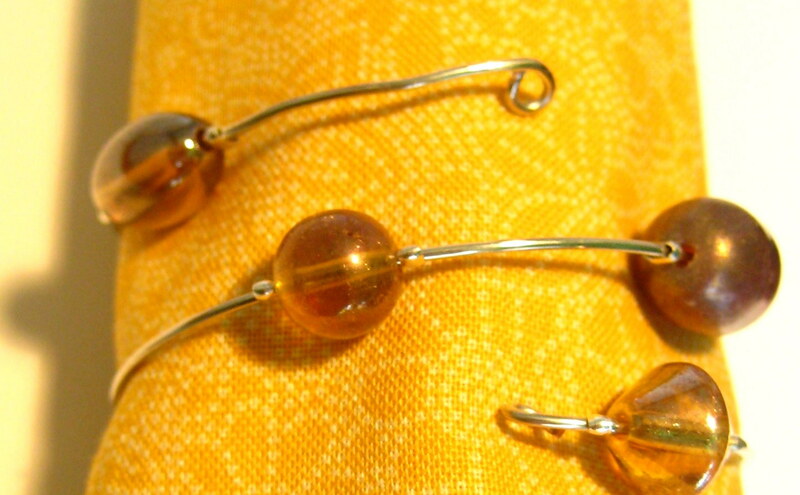 Next, find a pretty bead (so named to distinguish it from a crimping bead) and thread it on. Follow with another crimping bead and crimp it. This will keep the pretty bead from sliding around. Keep following this pattern (crimp bead, pretty bead, crimp bead), spacing them out any way you like until you have filled that side of the spiral. Flip the wire over and start to fill the second side. I did this half and half technique because some of the beads were difficult to move along the spiral (they were too long and straight) so I wanted to only thread them half the distance. I found that the thinner beads like the two far right in the picture below, were much easier to thread onto the rounded wire. The other two I saved for the ends so that I wouldn't have to bend the wire too much to get them on. The wire sometimes got a little wonky when I was threading the beads. I just made sure to go back and bend it back into circles again. At each of the ends I used the round-nosed pliers to create a curl. This is with two of the napkin rings on it to give you an idea of what a longer ring would look like. Great job, Terry! It's so pretty I would wear it as a bracelet! An excellent tutorial (great tips), a fabulous idea, and a beautiful napkin ring, Terry! I love napkin rings but usually the ones I really like are too expensive, but I believe I will make my own - thanks! Great Job Terry!! I think I could even do this. I love the beads you choose. Great Tutorial. Well aren't those just too stinkin' cute!? That really is beautiful. You did a great job. Thanks for sharing at my Sizzle into Summer party. Just beautiful. I have to get my 12 year old daughters (twins) to follow these instructions and make us some of these. SO pretty. They look great. Nice job on your first official tutorial. Love this idea and tutorial.